The arrangement of the genes on the chromosome corresponds to the sequence in which the genes are expressed along the anterior-posterior axis of the body. 121.10 Homeotic genes, which determine the identity of individual segments in Drosophila, are present in two complexes. The Antennapedia complex has five genes, and the bithorax complex has three genes. genes, and the Antennapedia complex has five; they are all located on the same chromosome (IFigure 21.10). In addition to these eight genes, HOM-C contains many sequences that regulate the homeotic genes. Remarkably, the order of the genes in the HOM-C is the same as the order in which the genes are expressed along the anterior-posterior axis of the body. 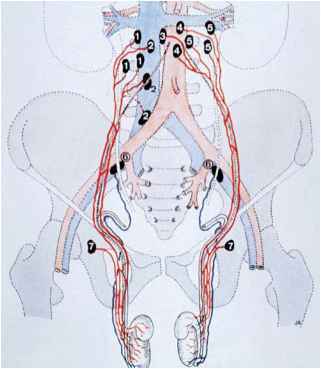 The genes that are expressed in the more anterior segments are found at the one end of the complex, whereas those expressed in the more posterior end of the embryo are found at the other end of complex (See Figure 21.10). The reason for this correlation is unknown. Homeotic genes help determine the identity of individual segments in Drosophila embryos by producing DNA-binding proteins that activate other genes. Each homeotic gene contains a consensus sequence called a homeobox, which encodes the DNA-binding domain. After homeotic genes in Drosophila had been isolated and cloned, molecular geneticists set out to determine if similar genes exist in other animals; probes complementary to the homeobox of Drosophila genes were used to search for homologous genes that might play a role in the development of other animals. The search was hugely successful: homeobox-containing (Hox) genes have been found in all animals studied so far, including nematodes, beetles, sea urchins, frogs, birds, and mammals. They have even been discovered in fungi and plants, indicating that Hox genes arose early in the evolution of eukaryotes. In vertebrates, there are four clusters of Hox genes, each of which contains from 9 to 11 genes. Interestingly, the Hox genes of other organisms exhibit the same relation between order on the chromosome and order of their expression along the anterior-posterior axis of the embryo as that of Drosophila (iFigure 21.11). Mammalian Hox genes, like those in Drosophila, encode transcription factors that help determine the identity of body regions along an anterior -posterior axis. Genes shown in the same color are homologous. There are four clusters of Hox genes In mammals, each cluster containing 9-11 genes.